We all know how important regular dental care is for ourselves and our children. 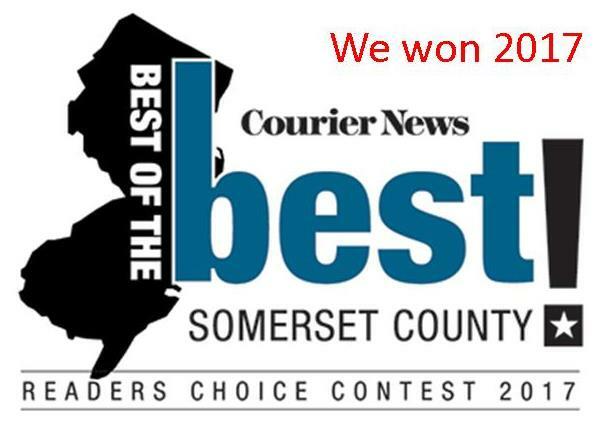 We don’t even think twice about daily brushing, annual check-ups and professional cleanings for ourselves. However, it’s just as important for our pets as well. It is so important, that February is National Pet Dental Health Month where everyone is encouraged to learn more on how early prevention and good dental care is essential for good health. It is also very important to understand all of the consequences of poor dental health and delaying care, especially as a pet gets older. 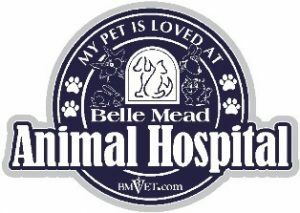 Every month is dental care month at Belle Mead Animal Hospital where we are helping protect pets daily. We just wanted to pass along some information that you can reference all year long. Keeping up with your pet’s oral health is one of the most important things you and your veterinarian can do to maintain and improve a pet’s well-being and longevity. Oral disease is the number one medical disease that affects our pets today. It’s now a well-known fact that 80% of dogs and 70% of cats have some form of periodontal disease by the age of two or three. 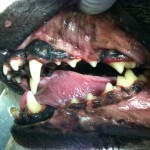 Oral disease is such a huge problem because most pets don’t show signs of pain or discomfort until really late stages. It’s also true that most pet owners don’t look in their pets mouths or know what is actually occurring. Consequently, most pets don’t receive regular home care and as-needed professional care. Thankfully, more and more pet lovers are learning how important earlier preventive care can help protect every pet so they can live healthier and years longer. 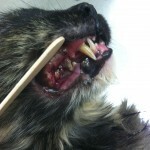 Most pet dental disease occurs below the gums, where you can’t see it. However you and your vet can make an educated guess of what may be going on under the gum line by “flipping the lip “and taking a good look in the mouth. Your veterinarian will help you gain a better understanding of what stage your pet’s teeth are in. 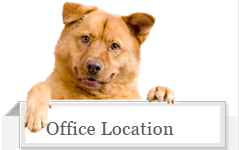 Scheduling yearly dental exams with your veterinarian is essential for your pet. Gums and teeth are staged with a score or grade progressing from 0-4. Most dogs have 42 teeth, cats have 30 teeth and people have 32 teeth. Every tooth in the mouth is important and can progress from Stage 0 (normal) to Stage 4 (most severe). Every pet owner needs to know that all Stage 1-3 affected gums and teeth can be completely reversed and restored to good health with a thorough professional cleaning. Having a groomer or doggie daycare facility brush your pet’s teeth once in a while is not a cleaning and is not going to help prevent dental disease. Dental disease starts off quiet and invisible. It begins when microscopic liquid bacteria stick to a pet’s teeth. This biofilm of bacteria, if not brushed away daily or professionally cleaned on a regular basis, likes to live on teeth and create disease mostly below the gum line. These bacteria push gums away from teeth and form deeper and deeper pockets in which to live in. They multiply and create red gums, which is gingivitis, and harden into brown plaque and tartar. This tartar causes bad breath which is a sign of infection. Over time the bacteria continue to accumulate below the gum line and the infection eats slowly away at all of the underlying supporting structures of the tooth, especially the bone. When this infection destroys greater than 50% of the bone affecting that tooth root, it’s considered a stage 4. 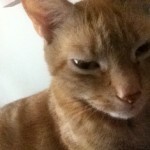 Stage 4 disease is serious and painful, but pets will not cry and will continue to eat. There are also a number of other painful conditions like cavities, tooth root abscesses, and resorptive lesions that can develop and hurt pets under the radar. 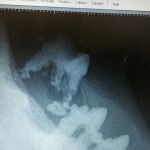 Pets need digital dental X-rays even more than humans because they can’t advocate for themselves. All pets are silent sufferers with hard wired instincts that push them to hide pain from everyone including their loving owners. Many times owners don’t know their pets are in pain until we actually find and remove the pain. The good news is that all the dangers of a painful infection are eliminated once the diseased tooth is gone and the bacteria are flushed away. The mouth infection is the source that must be kept clean and protected. Long standing infection in the mouth can increase the risk for cancer of the mouth, fracture of the jaw, nasal infection and abscesses that can even result in blindness. However, we cannot lose sight of the fact that undiagnosed and untreated dental infections can spread microscopically throughout the entire body. Studies in people and pets link and show that periodontal disease can actually directly damage internal organs, including the heart, liver, and kidneys. It’s not difficult to believe or understand that the constant presence of bacteria spreading directly into the bloodstream through inflamed and compromised gums and tooth roots can actually create disease or worsen disease that already exists. This is especially true in older patients. Senior pets greater than 7 years are at a much higher risk for developing painful mouth conditions. 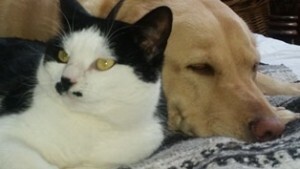 As people and pets age they also develop many genetic chronic conditions like heart disease, diabetes and kidney disease. Older pets have older organs and systems but they can still continue to function if we are proactive in keeping them as far away from infection as possible. We don’t stop taking care of our senior parents or grandparent’s teeth because they are old or have kidney or heart disease. On the contrary, all of these older age conditions that arise are easier to manage if pet parents keep up with daily home care and as needed professional cleanings. Anesthesia is an absolute necessity for dental cleanings and dental cleanings cannot be done properly without it. Anesthesia allows us to do a thorough exam and digital X-rays of your pet’s teeth and roots so that no problem is missed. Anesthesia keeps your pet safe from being harmed or scared. It allows the hygienist to properly remove tartar and ultrasonically clean deep enough under the gum line to flush out bacteria on bone and reverse disease. We also polish their teeth and they go home the same day with a fresh, pain free mouth. The truth is that pets who receive more regular, as needed professional dentals live years longer than pets who don’t get that same level of oral care. Pets who have their teeth cleaned and X-rayed on a more regular as needed basis have shorter, safer anesthetic cleanings. It’s much safer to anesthetize a pet every year for a 20-40 minute (grade 1-2 dental cleaning) than to wait too long like 3-5 years where dental stage is 4. Stage 4 periodontal disease is more severe and infection can be more systemic. Stage 4 gums and teeth need oral surgery. 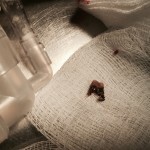 Surgical extractions require much longer anesthetic procedures. Pet owners need to understand that if they want to minimize risks to their pet they should not wait until their pets are elderly or showing signs of pain before they are willing to schedule an anesthetized dental procedure. Anesthesia is safer than ever before when performed following the most current AAHA Anesthesia guidelines and standards of care. However these guidelines are not mandated and regulated for pets on a national or state level. Therefore it’s always a good idea to check with your vet and make sure they are AAHA accredited and ask questions before the procedure on all the safety protocols and monitors. 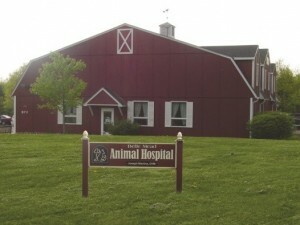 Hundreds of dogs and cats get professional dentals at Belle Mead Animal Hospital each year. We are AAHA accredited and we do protect every pet with an IV catheter, fluids, warming blanket and by using the most up-to-date anesthetic monitoring equipment possible. All this being said, it is still understandable for many pet parents to be anxious about anesthesia, especially in an older dog or cat. Some people may even think that some pets are too old for anesthesia. This is a misconception because age is not a disease. 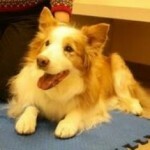 If the pet is otherwise healthy, then his age should not increase the patient’s risk of problems. Some older patients are approached more cautiously than others because older pets are more likely to have some concurrent systemic illness. For this reason every pet that is being considered to be put under anesthesia is examined first so that a doctor can assess whether there is an increased risk to the patient. Additional tests like full senior blood panels, urinalysis, and even chest x-rays in some cases are ordered prior. If your pets test results do not detect any underlying problems than most risks are minimized. Even if there are some borderline results the risks and benefits must be weighed against poor dental health. A well trained, experienced veterinary team can safely anesthetize senior and geriatric patients with or without systemic disease. 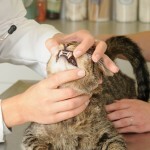 During your pet’s dental exams we can also show you how to care for and brush your pet’s teeth. Brushing is the single most effective thing you can do to keep your pet’s teeth healthy between dental cleanings. There are also VOHC approved dental foods and treats that we can recommend to help promote better dental health throughout the year. We want to help you be more proactive in caring for your pet’s mouth so that we can reduce the need for longer and more extensive professional cleanings and surgical procedures.